Holy smokes my life has gotten busy! I have 7 book signings scheduled, note that I am still working full-time (loving every minute). I’m glad I found some time to get a recipe out for you all before my busiest week, I have 3 book signings this week, and a TV appearance! Everyone keeps asking me if I am nervous about my first book signing. I haven’t even had time to worry about my nerves for the first book signing, with the upcoming TV appearance looming. I have never been on TV, and it will be LIVE! You bet I will be practicing my recipe I will be making over and over before then. We may never eat Pork Carnitas again after this week is over. Here is my YouTube video on the making of this dish. You can follow me on YouTube here. 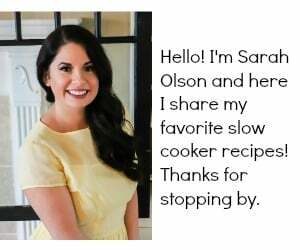 I used my Oval 6-quart Slow Cooker for this recipe. why can’t I print it? Darn it! That function was fixed a few days ago. I will look into what the problem is. If you can copy and paste it into a document, then print, that would work. I apologize. I haven’t been able to print them either. Please let me know when fixed. Just suggest to people to take a screenshot on their phone or tablets. Then they can either email out print from there. Great idea! Thanks for the help! I am upset that I can’t print this – I can’t even do copy and paste. I had to write the recipe down because I am making it tonight I hope this can be changed. I don’t like subscribing to pages – then I have a mail box full of things and I can’t keep up with my mail. 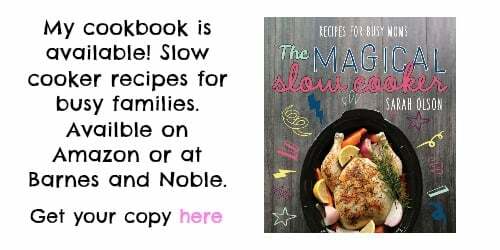 Sounds fab and my family will love it! I think I would rather do boneless ctr cut pork chops & try it with the sweet potatoes, like the lady above suggested…… Do you think there would be any difference in the time?? If I don’t put the green beans in do I need to add more liquid?? Can it be cooked for 8 hrs if on low setting? Some people on the comment thread have done it with success. I have not tried, sorry. Could I replace green beans with asparagus or will it get too mushy? I would add the asparagus the last 2 hours. It will get dark colored, if love love asparagus this shouldn’t deter you. Can I cook this on low for a longer period of time and still have it come out OK? I work all day so 4 hours just doesn’t work for me but this sounds soooo good. I MADE IT THE OTHER NIGHT. I PUT ONE CAN OF GREEN BEANS AND CUBED 3 POTATOES AND PUT THE CHICIKEN IN THE MIDDLE. THEN I SPRINKLED THE DRY ITALIAN SEASONING OVER IT AND THEN MELT ABOUT 3/4 STICK OF BUTTER AND POUR ON IT. I COOKED MINE IN THE OVEN AND IT WAS REALLY GOOD. 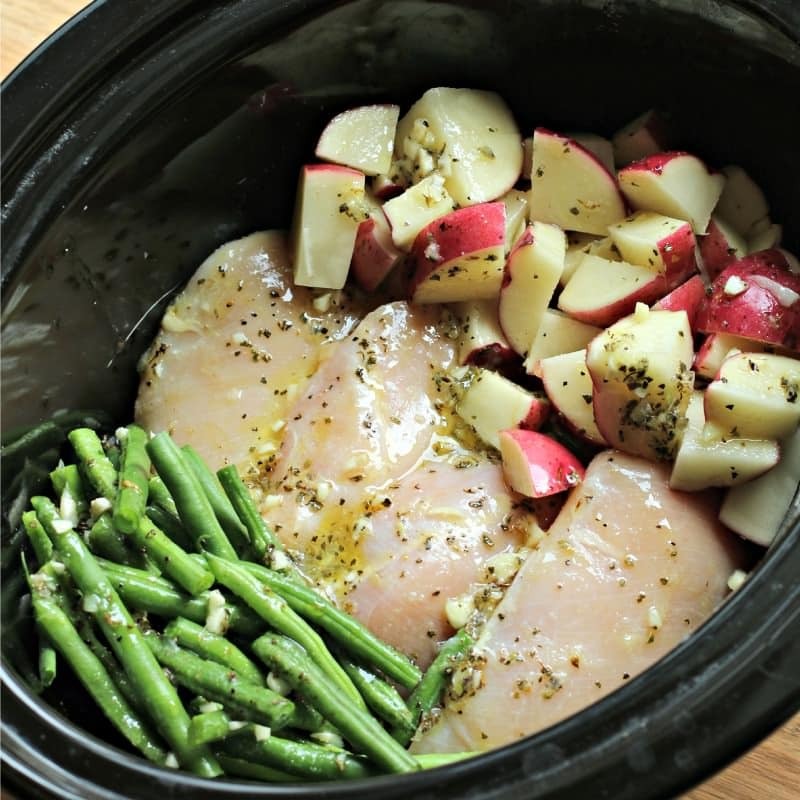 As much as I love the idea of using the crock pot to avoid heating up the kitchen on a hot day, I think my family would like it better with some more color to the chicken. How long did you bake it in the oven for & at what temp? Thanks! I’ve been making this for years with the chicken breast, canned green beans, diced potatoes and dry ranch packet with one stick of melted butter. I bake it at 375 degrees for 35-40 min. I cube my chicken breast first. 4 hours on high? Not to long or high for breasts? Do they dry out? Actually pat, you can, put it on low for 8 hours, I’ve been getting pretty fluent in crock pots, when needing to adjust times/temperatures, just think, the fast you want it cooked, the higher the temp, the slower, the cook time, the lower the temp, I’ve learned with other recipes, that call to be cooked on high for two hours, to put them on low for four hours, just as an eight hour dish recipe on low can be done sooner if you cook for four hours on high, the only time this hasnt worked is when adjusting meat temp from original recipe, use thawed if that’s what recipe calls for, but my suggestion is to try and cook this one for 8 hours on low, or invest in a digital crock pot that shuts off and only keeps warm after timer is done. A few people have commented that it works fine on low for 7-8 hours, I have not tried it that way yet. Love the simplicity of this recipe Sarah! so simple and looks so yummy! I can’t wait to make this one! I’m adding in to my meal plan right now! Marilyn I’m doing it your way, that sounds so good. I am so excited for you that you have so much good stuff going on! Hope it is a great week and thanks for the recipe! can I use garlic powder instead of cloves and how much would you suggest? I would start with a 1/4 tsp. taste it, then add 1/4 tsp. more if you think it needs more seasoning. 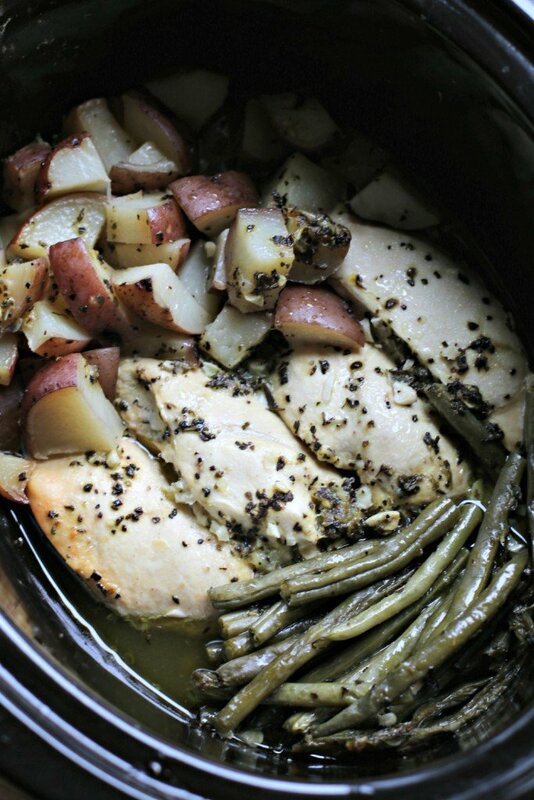 Mmmm, this looks great and love that you can cook the whole meal in the slow cooker! How about using zesty Italian dressing? I have made an Italian Chicken recipe, with chicken, carrots, diced potatoes, Italian dressing (about a half bottle) and a sprinkle of parmesan cheese. Very similar to this recipe, and very good! I thought you had to put potatoes on the bottom of the slow cooker and then meat on top so the meat doesn’t get overdone on the bottom. 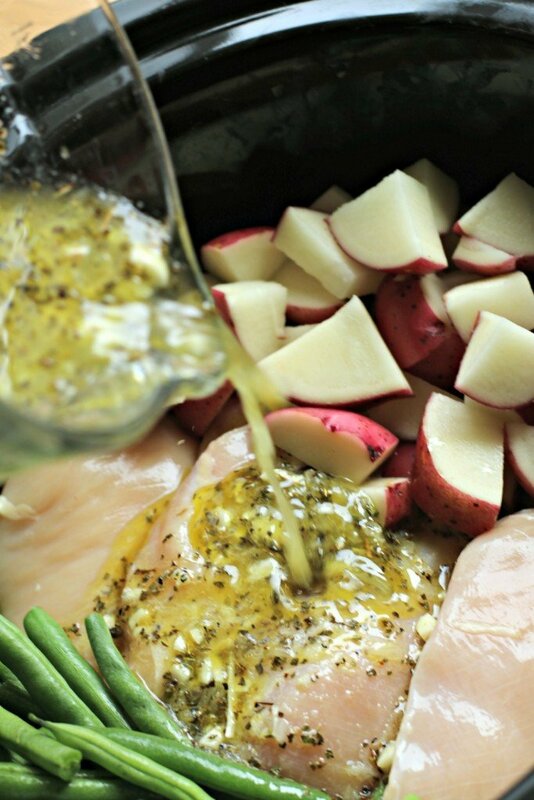 Wouldn’t this recipe come out better if the potatoes were under the chicken? 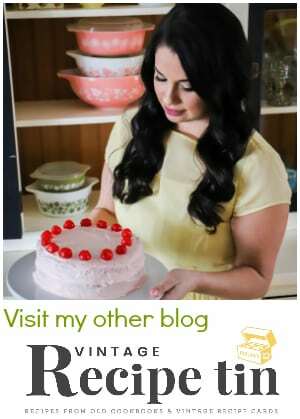 Just found your blog and am excited to try some of the recipes. I would really like to try this recipe because the cooking liquid sounds really yummy! The flavors were so delicious!!! but the chicken was so dry inside that it was hard to swallow without water immediately to wash it down:( I followed everything exactly…. Do you know what I could do next time to avoid this? Such an exciting time! I hope the book signings and the TV gig go well! I know you’ll do great 🙂 I love how simple and healthy this recipe is! Another winner!! This recipe looks like a keeper! I love that you added the potatoes and green beans! Do you happen to know the nutrItional info for this recipe? Printing problem? Highlight the recipe, then press Ctrl/p. Be careful that nothing else on the page in highlighted. The recipe will print as it appears on the page. Just copy and paste it into a Word doc and then print it. The recipe looks easy and yummy and healthy! thanks! Quick question… my chicken turned out kind of dry and wondering if it was that I used kosher salt by accident??? That would probably be fine, did you use thawed chicken or frozen? We made this when having another couple over for dinner, and had the same exact issue with the chicken being too dry. The seasoning was delicious, though. Has anyone tried this with boneless skinless thighs? I don’t care for slow cooked boneless skinless breasts. Someone mentioned lack of color…I *always* brown my meats before putting in the slow cooker.It is an extra step and an extra pot, but it makes a big difference in appearance (and taste, IMO). Has anyone tried it with boneless skinless thighs? If I leave out the beans, would you just mound the potatoes on either side? I would be rather serve the beans separately. I would like to try a whole (cut up) chicken with this recipe, would the cooking time be the same? I would cook for one more hour. Can I add more chicken breast? This is a couple years too late for your need but i’ve made this a couple times & I use Annie’s lemon & chive dressing – because I had it and it was easy , it turns out really great. would you recommend fresh or frozen chicken ? ThIs sounds so yummy! I’m wondering though, could I just put the potatoes on both sides and cook the green beans separately? I like my green beans cooked a specific way, and I’m afraid they would be too mushy for me if I put them in the crock pot that long! Also, do you happen to know how many servings this is, so I can figure out my calories, fat, etc for the recipe? You might try the Italian dressing or sage for more flovor. i was wondering is this meal can be prepared ahead of time and frozen and just taken out and cooked whenever you want to use it? Im trying to find easy recipes to make because we are moving this weekend and can not really find it in our budget to buy take out every day. Thanks so much for the awesome recipes! Hi Tiffany! I’ve only froze a few crock pot meals before, but I know for sure that potatoes don’t do well. would this recipe turn out if i substituted asparagus for green beans? I’ve made crock pot recipes with broccoli and asparagus. They don’t look great after they are cooked in the crock pot, even worse than the green beans. But I think it would taste fine! Yay! Thank you for letting us know that it worked for 8 hours on low, I never know how a recipe turn out with longer cooking. Thanks! If I want to make a bigger batch, say double the recipe, would I leave this in the crockpot for maybe 6 hours? Did you double the recipe? I am thinking of doing that, so I’m wondering how it turned out. Thanks! I did not, that is just one rack. I have done two racks of ribs in the crock pot before, I still cut each rack into fourths. Turned out great. Could I cook it on low for like 6-8 hours instead? Someone else cooked the original recipe for 8 hours on low and said it turned out fine. I personally haven’t tried that yet. Hi Rachel,i had mine on low for 8 hours and it turned out PERFECT! ummm what size slowcooker? That’s the one thing that bugs me about online recipes… almost no one bothers to mention the size of the slowcooker. I have three different sizes myself. Obviously the 2.5 qt won’t do, but should I use my 4qt or 6qt? I usually add the size, but missed it for this recipe. I used a 6-quart oval. I just saw this recipe & have to try it…NOW! I already have everything except the fresh green beans. Do you think canned would work? Would you still add them in the beginning? Thanks! Thanks! That’s what I thought too. I don’t have any lemons or lemon juice, can I just leave it out or use something else? Hmm, I just saw this. I don’t know how that would turn out. The lemon definitely gives this dish flavor. Can you please explain why we shouldn’t use bottled lemon juice? What would you recommend in lieu of fresh lemon juice? Thank you!! Bottled lemon juiced tastes different, and is not what I used in this recipe. A few people used it and did not like. I would buy real lemons, I can’t think of a substitute. I apologize! I work 8-5, would the recipe work if i cooked it on low? If so how ling would it be for? I believe 2 people did this for 8 hours on low and had sucess. I made this last night for dinner and it was delicious!!!! I did not expect the sauce mix to give it as much flavor as it did. So simple yet so tastey. Deffinitly going on the meal rotation!!! Is it going to be good still if it cooks for about 9 hours on low? Would affect anything by using a 5 quart crock pot instead of a 6 quart? I made this yesterday and it was delicious!! I added a few more seasonings and some broccoli to it as well, set it all on low, and let it cook while I was at work for 9+ hours. The chicken just falls right apart and everything had great flavor! Will absolutely make again! Thanks! I love making this recipe! It’s so good! I also found that adding vegetable broth keeps the chicken extremely moist! I madE this recipe today. The only thing I found wrong with it was the green beans were way over done. Next time, I think I’ll make the beans separately. The chicken was tasty and moist. Would it be okay to use tenderloins or filleted chicken breast? And would it be cooked any differently? I think tenderloins would work great! They may come out a little more tender than the breasts, but the cooking time would be the same, so the potatoes would still get tender. This is very good. It has a homey flavor that reminds me of something mom would make. Not over the top spicy (almost not spicy enough), but the good old fashioned seasonings that taste better with every bite! Thanks. Do you think using coconut oil instead of olive oil would ruin the taste? If you are used to the flavor of coconut oil, it would probably be ok, besides the lemon and the garlic have a strong flavor in this dish. I’m going to try this recipe and I think the chicken will be more tender if it’s marinated first. I’ll keep you posted on the outcome. That is a awesome idea. Yes let us know how it does! Can this also work with leg quarters????? Yes I think they would do fine. Just don’t open the lid while it cooks so the chicken gets done properly. Every time I put root veggies in the slow cooker they stay hard (ex carrots, potatoes) and when I add onions or celery for that length of cooking time they make the recipe fail. Are you opening the lid at all? Every time the lid is opened there is a chance that things won’t get tender in time. If I cut the recipe in half to accomodate for 2 do I cut the cooking time in half as well? Interesting recipe! I just cooked mine in the oven at 425 degrees for 40 minutes. I parboiled my potatoes before putting everything in the oven to make sure they cooked all the way through. I didn’t have any onion powder or onions so I left that out. Very tasty, but I think I need to add onion or sub out the oregano for Italian seasoning next time since there still seemed to be a missing flavor that would take it over the top. The onion powder adds a lot of flavor, but it is a great recipe to add what you like in it and make it your own for sure! I tried this recipe and it’s so delicious and simple! This recipe was NOT for me! The finished product tasted so flavorless, and I followed directions exactly. I like my green beans actually green and the chicken just cooked in this watery liquid, which made it crumbly and not at all moist, which is weird. If you usually like your food tasting fresh and packed with flavor, I’d look elsewhere. No, I mean no offense, I just want to be honest about my experience. I had the same intial reaction so I tried one more time and added about 2 cups of chicken broth and added a little more of the spices and it turned out great! Now it’s a house favorite. Cooking time also had to be adjust for me to not get that dry, flavorless taste. Wow!! wonder where you went wrong? Could I cook on low? How long? 6 or 8 hours? Some people have commented that that does work good, I personally haven’t tried that yet. Sorry Asleigh, I don’t have that info. You’ll have to enter it in on a calorie counter website. If I used broccoli instead of green beans should I add it later so it won’t over cook? That probably would be best, but it still will take about 2 hours to cook. Can I do this on low for 8 hours? Made this yesterday…very easy and so delicious! 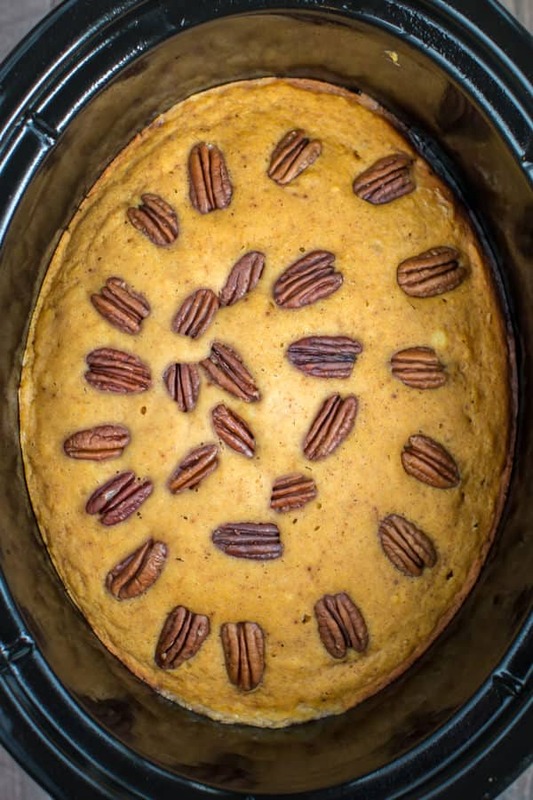 I’m going to try sweet potatoes next time as another reviewer suggested…Thank you for sharing Sarah! Trying it now but I made it worth the 100% lemon juice from the bottle I didn’t read the last sentence until after blending the mix up so I’m crossing my fingers! Looks and smells great so far! I cooked this in my 5 quart slow cooker for 5 hours on low and it turned out great! I didn’t have any onion powder so I just used some regular chopped onion. The lemon juice really makes this recipe! I will be trying another one of your recipes soon! I am currently on the 21 day fix and also trying to please my man for dinner. This was a win and so great, fresh, healthy, and I wouldn’t change a thing. Not being able to print wasn’t an issue, easily recalled on my pinterest for easy access. 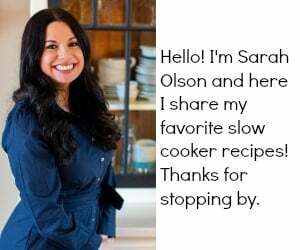 I look forward to exploring more of your recipes, thank you so much! I did do 7 hours on low, but I have an oval, smaller than 6 quart. I forgot a lemon… Any suggestions for a sub? Hmm, maybe some sort of vinegar. When I created the sauce I kept testing it before I cooked it. If the sauce tastes good before you put it on the chicken, it should be good! Can I use canned green beans instead? Thats all I have at the momnent. I think it would be fine. I often cook canned green beans for long periods of time in the slow cooker. They don’t change much after cooking. I’m working on fixing things right now. My old theme stop working today and I have been working diligently to get things back to normal. May take a week to do that. I apologize. Do you need me to send you the recipe? Made this tonight exactly like the recipe said. The crockpot was full of juice and it smelled soo good. The fresh green beans and potatoes had a great flavor but the chicken was so dry we could barely eat it. Everyone else had great reviews about the chicken but I didn’t do anything different…. suggestions? Im thinking maybe cooking it longer at a lower temp next time? I would really like to try this again because the flavors were great! Followed this recipe to a T, and it was a hit! Easy and delicious. Thank you. Will make it again in the very near future. I made this today and I just finished eating a portion. Wow, it was wonderful, flavor was excellent! Thank you for the recipe I would definitely recommend this for a Sunday late lunch or dinner. How would I have to revise this recpie if I wanted to double it? Maybe some red wine vinegar? Taste the sauce before adding it to the crock, it should taste good before cooking it. Hi – can I adjust this to the instant pot? Anyone done this before? If i wanted to cut this recipe in half, would I still put it in for the same amount of time? Also, could I still use the same amount of the lemon juice, spices, etc, even after cutting the amount of green beans, chicken, and potatoes in half? Or would the amount of liquid effect the way it cooks? Thanks in advance! Can’t wait to try!! It may be kind of soupy with half the chicken, green beans and potatoes. Tried this tonight. the green beans were great as were the potatoes. The chicken was very dry and bland. A little siracha helped but I think I’ll either do Italian dressing or double the mixture. I just bought a new pressure cooker XL which is supposed to cut time down. How long would this cook in this new cooker….I’m assuming not 4 hours…? I have a 4qt crock pot would this still fit? Do you think it would come out okay if I added carrots? If so would the cooking time stay the same? I can’t wait for dinner to try it! I read some comments about the chicken being dry, so I seared each side for a couple of minutes to try and lock in the juices. I also put a little more lemon juice and olive oil since I added the carrots to it. Hopefully I didn’t change it to much. Can this be made in a 3-quart crockpot? Can the chicken sit on top of the veggies? We are renovating our kitchen and I really wanted to make a home cooked meal for my husband after he got home from a business trip. This was perfect! I loved the flavor and the chicken was tasty, not dry like I was afraid it would be. The potatoes are really the best part of this dish in my opinion. And the best part if that you can easily make it without a kitchen! Instead of having green beans in this can I do asparagus instead as an alternative? 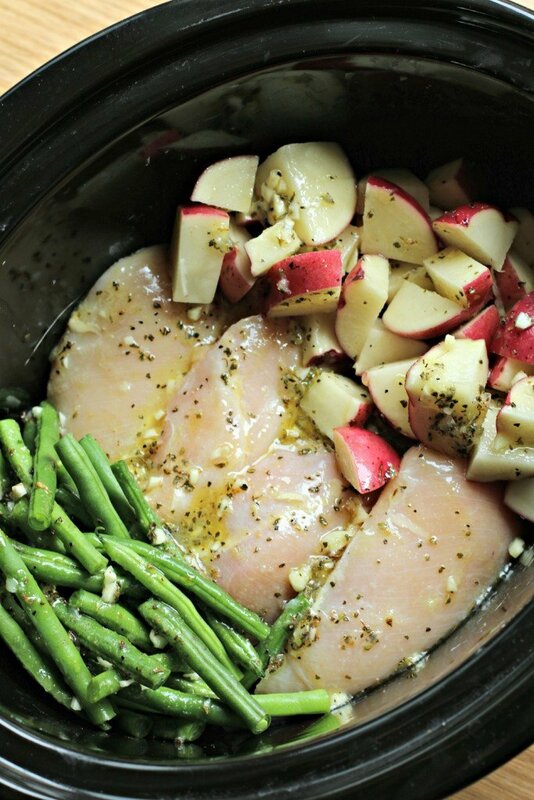 I’m going to make my first crockpot meal and I would like it to be this one. Does anyone know how long I have to cook and on high or low the chicken if it is frozen? I just wanted to say I was skeptical at first, I’ve been guilty of using the seasoning packets but for just a little extra time to prep, this was wonderful. My picky 7 year old loved it. My chicken was little on the thicker side so it wasn’t dry at all. Super good, will definitely make it again! Thanks! Yummy meal–I followed the recipe exactly but used my Instant Pot (9 minutes on Poultry setting). This will be a new regular meal for us. Tried this recipe for the first time last night and the family loved it, including my picky 8 year old. We are going to double the chicken and green beans for the next go round so we have left overs! I’ve made this recipe twice now and the flavour of the beans and potatoes was fantastic but both times the chicken has been incredibly dry. The first time I cooked on low for 8 hours and figured that might be the reason the chicken dried out, but tonight I followed it to the letter and the chicken came out even worse. Such a shame because we love the flavour but don’t think I can risk cooking such dry chicken again. I think adding some chicken broth would fix the problem! This is great! I made it this evening. I followed the recipe except for adding a sliced lemon and more oregano, but otherwise to the letter. Done in four hours, and the chicken breasts were juicy and tender. Next time I’ll use fewer potatoes, but that’s a personal preference. This one’s a keeper! Hello. This sounds delicious! Insread of 2 garlic cloves, would garlic powder work? If so, how much? I haven’t tried garlic powder yet, but if I was going to I would start with a 1/4 tsp, and taste it, then add more if needed. I found this recipie and was excited to try it so before reading the instructions fully I whipped it together to have tonight. Then I got to the note at the bottom about using lemon juice from a jar! Of course that’s all we had so I used it. Is it going to turn out awful? Or just not as good as with fresh lemon juice? Ok so it didn’t come out horrible but it wasn’t great either. However the chicken cooked perfectly ! I’ll definitely try it again with fresh lemon juice next time ! Hi, I was just wondering if fresh diced onions would be an okay substitute for onion powder? If I am using a 3.5 quart sized crockpot to cook this meal, how long do you think I should cook this? I personally would try 4 hours on high still, and maybe check it at 3.5 hours if I was home. Can I sub asparagus instead of green beans? It’s what I have on hand? And about how many chicken breast is it? It’s about 3 chicken breasts. If you do asparagus it should do fine but the color of the asparagus cooked in the slow cooker is not pretty. Made this for dinner last night, started it at 3:30 pm with 3 frozen chicken breasts and peeled, cubed russet potatoes (that’s what we had and they were sprouting so needed to be cooked). Substituted thyme for oregano because that’s what I had, used kosher salt, I only had two fresh lemons left so a bit less the 1/3 c juice. After tasting the marinade made as instructed, I added Cajun seasoning and Lawrys all purpose seasoning to taste and drizzled more olive oil (to help with the slight decrease in fresh lemon juice). Set my crockpot to High. Since I used frozen chicken breasts, I anticipated at least 5 hours and had a possible back up plan for dinner (i.e., leftovers). We left to run errands for back to school stuff got home around 8, the house smelled great, I used my meat thermometer in the chicken and it was Ready I did cook the frozen green beans (again what I had on hand) separately and my family loved every bite!! Great recipe with a few of my accommodating adjustments, thank you for sharing!! I love your version. The Cajun seasoning is a great idea! I actually think 5 hours on low would work fine! I don’t see why not Victoria! I’ve tried this 3 times and the chicken always ends up dry. Can I cook this on low? I’ve tried adding more liquid and also not cooking for as long. Not sure what to do. Breast sometimes can end up dry. You could try boneless skinless thighs maybe? I made this last night… it was pretty good, but the green beans and potatoes weren’t as tender as I would have liked. Flavor was good, and chicken came out great. I didn’t want it to get too dry so I took the chicken out and let the veggies stay in the cooker, but that was after we had already eaten dinner, so I haven’t even tried them to see if they got any softer. That’s the only issue I had with this recipe…. but it was good and healthy so it was still a winner, and the kids didn’t seem to mind the crunchy green beans. Hi Tasha! Did you leave the lid on the entire time? That is the only thing I can think of that would be the problem, even if it is opened once it can effect the tenderness of the veggies. I don’t have some ingredients so was wondering if fresh carrots would work and onion soup mix with olive oil or beef broth because that’s all I have. What do you think? How many calories is this? Do you know? I don’t have a 6 qt but I do have a 3-4qt. Would that also work? Hi Mags, if you can get it to fit, it should work fine. Leave the lid on the entire time. I made this yummy dish yesterday. My husband and I enjoyed every bite. I followed the directions exactly, and it turned out perfect.Thank you, Sarah. We’re looking forward to trying more of your delicious recipes! Happy New Year! You must cook the beans n potato’s for longer than 4 hours in order for the veggies to be soft… otherwise they are hard and crunchy. It may take longer if you cut the potatoes too large or open the lid at all. In my video I cooked for only 4 hours and they were tender. Used the lemon juice from the little squeeze lemon and it DID taste good. I made this today and it tasted great! I’m not normally a big fan of potatoes but I thought they soaked up the lemon dressing/sauce so nicely and I couldn’t get enough! Thank you for sharing. that’s awesome Tabitha. Yes I love the potatoes in this meal! My family will love this and I love that the whole meal is in there! No making something to go with it. Yay! I Only have the lemon juice in a bottle, why won’t this taste as good? Have you made it that way before? Lemon juice out of bottle has a harsh bitter taste, adding a 1/4 cup of it to this recipe will leave a funny taste to the sauce. Thank you for your honest opinion! How long should I cook it if I only have 1lb of chicken? I can’t find cook times anywhere on google. I cut the recipe in half and substituted asparagus in a 1.5qt. slow-cooker. I found 4 hours was too long. The chicken was tough and the asparagus mushy . Thanks for letting us know how it turned out for you with your changes. Silly question, can I prep this for the freezer? I am trying to stock my father-in-law’s freezer, and my husband and I love this recipe. Thanks! Can the crockpot time be set on low for 6 hours or will that cause problems? I think that amount of time would work good! Thanks for the recipe. Question: why would you not suggest using fresh lemon juice in the beginning of the recipe and not as a “oh by the way”? Other than that, a great recipe. It does say fresh in bold letters. People who use squeeze bottle lemon juice have been disregarding that. Hi! I love this recipe…I’ve made it twice. However, both times the chicken has been dry…its fall apart tender but still dry. The first time we cooked it for the 4 hours on high but we were not home from work so the crockpot clicked over to ‘warm.’ We thought it was cooked too long. However, we made it again last night and we ate it immediately after the 4 hours and it was still dry…tender but dry! Any tips? It’s very tasty! Love this recipe – easy to make – delicious. I’ve made it for friends recovering from surgery, illness, etc. and they love it. My husband and I have this dish quite often. Would this work in a 6 qt. round crock pot? I love this recipe and it quickly became a family favorite! I’ve played around with the cooking times a bit because I tend to use thin cut chicken breasts and the chicken comes out a bit dry when I cook it on high for 4 hours. So far I have found that 5-6 hours on low works best for me. Thanks for the great and healthy recipe! I made this yesterday and the chicken turned out very dry… any suggestions? Would try again. Made this for dinner tonight and it was so easy and delicious! Followed the recipe exactly and everything turned out perfectly! We will definitely make it again. I remade this today. Added 3/4 a can of low sodium chicken stock and made the potatoes separate. Also, cooked on high for 3 hours instead of 4. It turned out much better and was moist. Not sure if my crockpot runs high, but last time chicken was extremely dry. I love this recipe. It’s one of the first meals I made for me and my husband right after we got married (it’s also the very first meal I made in a slow-cooker). I make it a few times each year and it’s sitting in my slow-cooker right now too, another 3 hours to go until dinner! This is one of my favorites. This is delicious!!! I will definitely keep this recipe in my dinner rotation. I followed the instructions exactly …….. soooo good. Can’t wait to make it again. I made this, the lemon was so overpowering, I thought it was horrible. I used a real lemon and not the lemon juse in a bottle. Can you cook this in a round crock pot? I dont have an oval. I cooked this in my slow cooker – not a crockpot. It was really dry and slightly burned on the bottom after four hours. Next time I will only cook it three hours and will use some butter too. I think that as well as a little chicken broth would give it a more robust and richer flavor. I pinned this recipe a few days ago & made it today. Gotta tell you, wow. I seasoned the chicken with S& P & Kickn’Chicken seasoning made by Weber & seared it first. Cubed 3 red potatoes & used fresh green beans. Due to time constraints, I drizzled some Annie’s Lemon & Chive dressing on it & 4 hours on high. It was fabulous, not dry at all, husband loved it. Thank you! Used broccoli, spinach and sweet potatoes instead of potatoes and beans. Can anyone suggest an alternative to the olive oil? that much adds over 450 calories to the dish! While I know that olive oil is relatively healthy, it’s still an oil and i’d rather spend my calories on the actual chicken or veggies. Would I be able to change the green beans to broccoli? If so, would I add them in just like the green beans or wait till it’s almost done? Can asparagus be used instead of green beans and if so should it be added later so it doesn’t overcook? I’d probably add at the half way point. But I do have to tell you it will not be a vibrant green after cooking. Still tastes good though. Love this recipe, I use chicken thighs instead of breasts as I find they always stay much more moist when slow cooking and subbed apple cider vinegar for the lemon juice.